What is humidity? How is Humidity Measured? What is humidity? How is it measured? Easily stated humidity is simply the amount of water vapor held in the air. Water vapor is the gaseous state of water. As the temperature of the air increases more water vapor can be held since the movement of molecules at higher temperatures prevents condensation from occurring. There are three main measurements of humidity: relative, absolute and and specific. Absolute humidity (units are grams of water vapor per cubic meter volume of air) is a measure of the actual amount of water vapor in the air, regardless of the air's temperature. The higher the amount of water vapor, the higher the absolute humidity. For example, a maximum of about 30 grams of water vapor can exist in a cubic meter volume of air with a temperature in the middle 80s. Relative humidity, expressed as a percent, is a measure of the amount of water vapor that air is holding compared the the amount it can hold at a specific temperature. Warm air can possess more water vapor (moisture) than cold air, so with the same amount of absolute/specific humidity, air will have a higher relative humidity. A relative humidity of 50% means the air holds on that day (specific temperature) holds 50% of water needed for the air to be saturated. Saturated air has a relative humidity of 100%. The relative humidity of an air-water mixture is also defined as the ratio of the partial pressure of water vapor in the mixture to the saturated vapor pressure of water at a given temperature (See what is vapor pressure). Thus the relative humidity of air is a function of both water content and temperature. Specific humidity refers to the weight of water vapor contained in a unit weight (amount) of air (expressed as grams of water vapor per kilogram of air). Absolute and specific humidity are quite similar in concept. Dew Point is the temperature at which air is saturated with water and condensation begins. The higher the dew point rises, the greater the amount of moisture in the air. Compared to relative humidity, dew point is frequently cited as a more accurate way of measuring the humidity and comfort of the air, since it is an absolute measurement (unlike relative humidity). The relative humidity is 100 percent when the dew point and the temperature are the same. If the temperature drops any further, condensation will result, and liquid water will begin to form. If the relative humidity is 100 percent (i.e., dew point temperature and actual air temperature are the same), this does not necessarily mean that precipitation will occur. It simply means that the maximum amount of moisture is in the air at the particular temperature the air is at. Saturation may result in fog on the ground and clouds aloft (which consist of tiny water droplets suspended in the air). While dew point gives one a quick idea of moisture content in the air, relative humidity does not since the humidity is relative to the air temperature. In other words, relative humidity cannot be determined from knowing the dew point alone, the actual air temperature must also be known. Where actual vapor pressure is a measurement of the amount of water vapor in a volume of air and increases as the amount of water vapor increases. Saturated vapor pressure is the maximum VP that can exist at any given temperature. Air which is at 100% relative humidity (RH) contains water vapor whose VP is its SVP at the given temperature. This corresponds to air which is in equilibrium with liquid water. RH is the ratio VP/SVP expressed as a percentage. 'Dry' air will contain water vapor with a VP which is less than the SVP at the given temperature. A device to measure relative humidity is called a hygrometer. The simplest hygrometer - a sling psychrometer - consists of two thermometers mounted together with a handle attached on a chain. One thermometer is ordinary. The other has a cloth wick over its bulb and is called a wet-bulb thermometer. How does a psychrometer measure relative humidity? 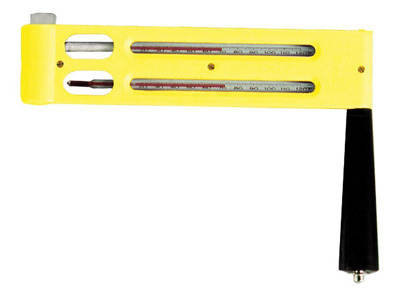 A psychrometer also called a sling psychrometer has two thermometers attached. One is dry (often called the dry bulb thermometer) and measures the actual air temperature. The other called the wet bulb thermometer has a has a wet cloth at the tip. As water molecules evaporate from the surface of the wet bulb they will take heat with them lowering the reading on the thermometer. The rate of evaporation depends on the vapor pressure or amount of water vapor in the air. At 100% relative humidity no water will evaporate from the wet bulb and the readings on both thermometers will be the same. Comparing the two temperatures in a chart will give the relative humidity. 2. The wet bulb of a psychrometer ? 5. Using the psychometric chart find the relative humidity when the dry bulb records 70 F and the wet bulb is 65F.